Step out of the shower or bath and into the luxury of toasty warm towels with the Ancona Comfort 5 Floor Curved towel warmer. This towel warmer offers constant comfort with effortless portability to any room in your home that suits your needs. With a 6 ft. long plug-in cord, the Comfort 5 Floor Curved is a quick and easy way to add elegance and warmth to your bathroom decor while creating a tranquil spa environment right in your own home. Beautiful in bathrooms and full of possibilities in the laundry room, exercise room, mudroom or bedroom - either way, it is sure to make life better. 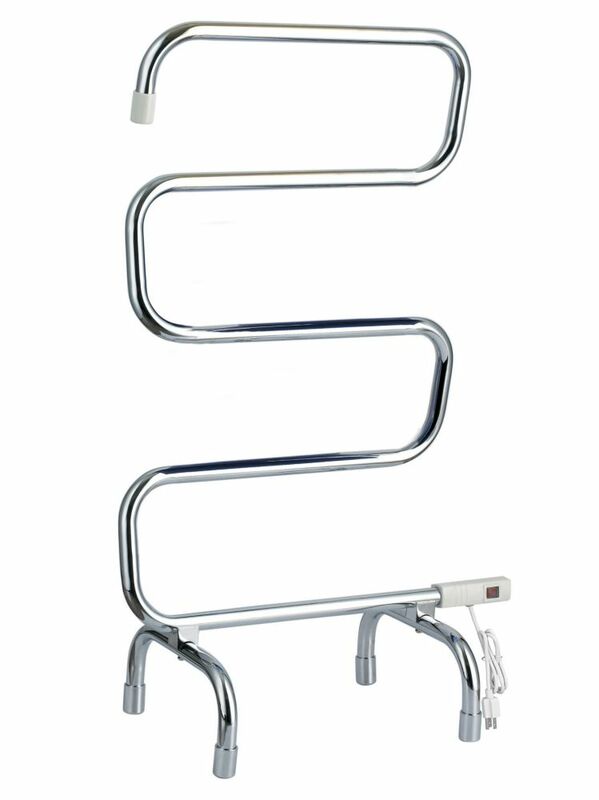 This multi-rod towel rack connects functionality with style. It features 4 rods, offering maximum storage. Strength and stability is ensured by its high quality brass construction. The chrome plated finish adds a modern touch to suit any home decor. A new take on a traditional design - this floor standing accordion rack is expandable! Constructed with powder-coated steel and expandable up to 30" / 76cm wide, this durable drying rack is ready to tackle your family's laundry with ease. Includes non-skid rubber feet to protect your floor surface. When not in use, quickly fold-up this drying rack to a compact 3" wide for easy storage. When space is at a premium or you only have a small amount of line drying to hang, Greenway's over-the-door drying rack is the perfect fit. Designed to suit most doors, up to 1.5in / 3,8cm wide, and includes adhesive felt pads to apply on the hooks to protect your door finish. This small but mighty drying rack will support up to 5 lbs. per bar for a total of 50 lbs. weight load capacity! Comfort 5 37 inch Curved Freestanding Electric Towel Warmer and Drying Rack in Chrome Step out of the shower or bath and into the luxury of toasty warm towels with the Ancona Comfort 5 Floor Curved towel warmer. This towel warmer offers constant comfort with effortless portability to any room in your home that suits your needs. With a 6 ft. long plug-in cord, the Comfort 5 Floor Curved is a quick and easy way to add elegance and warmth to your bathroom decor while creating a tranquil spa environment right in your own home. Beautiful in bathrooms and full of possibilities in the laundry room, exercise room, mudroom or bedroom - either way, it is sure to make life better. Comfort 5 37 inch Curved Freestanding Electric Towel Warmer and Drying Rack in Chrome is rated 4.0 out of 5 by 1.